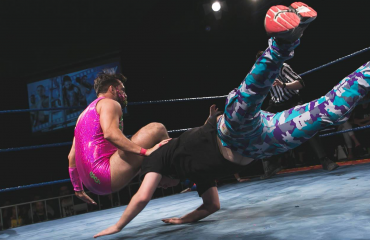 EPW was back at The Aberdeen with a new name but the same attitude from Explosive Professional Wrestling’s athletes. With PROGRESS x EPW on the horizon, every person on the roster was looking to make an impact and forge their own paths for 2018. The action kicked off at The Aberdeen Hotel with a four of the most electric competitors. These men flew all over the ring, looking to pick up the victory from the first bell. Zenith showed his tag team chops by looking comfortable in the multi-man environment, whereas Steria impressed as always with his truly unique combination of size and agility. 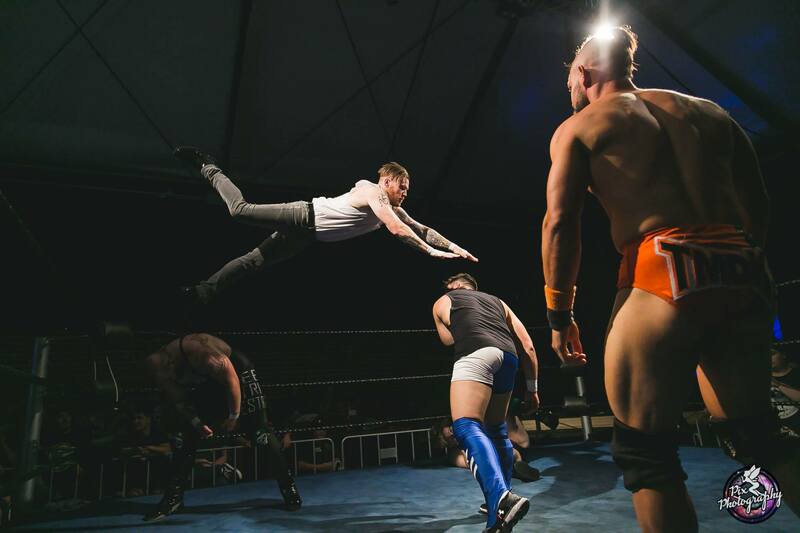 However, as it came to the end of the match, Nero enough wasn’t able to seal the deal despite hitting Steria with a 450 splash, and it was a surprise small package from Jay Taylor that won him the victory. Next was a brief break from in-ring action as Jack Edwards returned from his state of confusion, along with the imposing Tipene (‘Tip-eene’), to introduce Child Star Taylor King. King injected the show with a healthy dose of Vitamin K as he brought his guest for the evening… the A.S.S. Carrot. Before the rooted veggie could sprout the benefits of 2 and 5, King sucker punched the A.S.S. Carrot and had him escorted out by the Task Force. King remained in the ring to gloat, however, his celebration was quickly interrupted by the return of none other than… Gorgeous Garry! Garry took exception to King declaring himself ‘gorgeous’ and issued a challenge for a match. Unfortunately, Gorgeous Garry was instead left waiting as ‘The Child Star’ rejected the contest and proceeded to hit him with a cheap shot for good measure. It will be interesting to see what repercussions await as Gorgeous Garry was undoubtedly left seething after the outcome of his return to EPW. The new-look trio of The Headhunters were eager to squash the antics of the Nacho Friends and Ricky South from the get-go. To say Ricky South’s unique style left an odd taste in the mouth would be paying the man a compliment, as his grinding offence was a distinctive blend of mind games and showmanship. However, The Headhunters would not fall prey to these colourful games and capped off a dominating victory as they rise through the tag team division. Triple threat competition was next with Jordan Bishop looking to start his new path with a win against wily veteran Johnny Wimbledon, and the man serving a new purpose, Tyler Jacobs. Jacobs immediately took control of the ring to read the audience a passage from his ‘Good Book’. Having none of this, Wimbledon stole the book and engaged in a game of keepings-off, which only served to frustrate Jacobs. The three men seemingly looked to make a mark on the event, but in the end, it was the Expat Wimbledon who caught a stunned Bishop from the corner with a float-over neck-breaker for the 1-2-3. In a rematch from Hot Summer’s Night, these two athletes didn’t need the second invitation to start hammering away at each other. Both would have been disappointed by the end of their previous match- Ward for the cheap nature of the result and McGavin for not being smart enough to fool the referee. 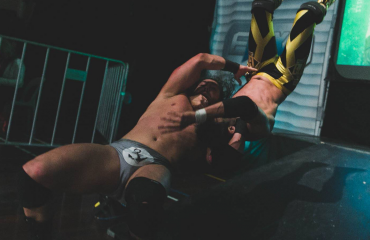 With a point to prove, the action was even as the two put to show why they are in the upper echelon of talent at EPW. If at first you don’t succeed, then try again. And unfortunately for the fans, this meant that once again McGavin took a shortcut. With the referee preoccupied, ‘The Real Wrestler’ hit Ward with the traditional Greco-Roman ‘Wrestler of the Year’ plaque to the head; a manoeuvre that claimed him a tainted victory. A frustrated EPW Champion kicked off the second-half of the show by openly questioning how the current state of the Championship title feud can stand: The No.1 Contender, ‘The Smashing Machine’ Chris Vice, refusing to sign the contract to face him for the title. After Vice’s attack at Hot Summer’s night, you can see why Morleone is eager to get his hands on him. It appears though Vice has other plans. Before the champ could find any answers he was interrupted by former Solution member, AZ Vegara. After the disbanding of the fallen group, Vegara was keen to show off his new aggressive attitude. It proved not to be enough this time as Morleone overcame the challenge and pinned AZ. This was all about opportunity: Who would win the chance to choose their opponent at the upcoming PROGRESS X EPW show on April 18th? Unlike the movie franchise, the action was fast and furious. Naturally, Cal Cousins was eliminated first, with bodies continuing to hit the floor at a rapid pace. The final four came down to Taylor King, Marcius Pitt, Davis Storm and Kiel Steria. At the end of the day, it was Davis Storm, The Ironman himself, who outlasted the field and eliminated Pitt for the victory. After the match, it was up to Storm to decide who his opponent would be for the Dream Match at PROGRESS X EPW. A candid and humble Storm spoke about the legacy of not only Perth professional wrestling but his own career. There is nobody prouder of EPW’s journey and its development since its inception than Davis Storm. Knowing EPW has created world-class talent and will continue to do so, Storm pondered his own place in the system. How does he measure up against the very best in the world? And with that, Davis Storm laid out the challenge to none other than WWE UNITED KINGDOM CHAMPION PETE DUNNE to fight at PROGRESS x EPW. This is the true definition of a dream match. This main event will tear the roof of the Vasto Club on April 18, so make sure you get your tickets now to avoid disappointment! The main event at The Aberdeen saw ‘The Big Rig’ Scotty Ryan attempt to defend his EPW Coastal Championship against ‘The World Beater’ Damian Slater. Slater fired up from the onset, looking to add the Coastal Championship to his already impressive resume. Ryan was his resilient self, showing the grit and determination that has kept him his Coastal Championship. Slater, of course, showed his true colours by disrespecting the time-honoured values of the ‘Gotcha’ game. Despite being ‘got’ and having to receive a punch, Slater decided to ignore the call and attack ‘The Big Rig’. However, Scotto fought back and eventually locked Slater in a Sharpshooter. The ‘World Beater’ was almost beat before escaping the submission. The intensity picked up as the match rolled on with both men exchanging holds and pinning combinations. In the end, it was Ryan’s bridging roll-up that caught Slater unaware long enough for the three count. A hard earned victory deserved a hard-earned beverage, but before Scotty Ryan could even begin to celebrate he was blindsided by Jay Taylor. Was it confidence stemming from his earlier victory that lead to this statement of intent? It appears the former Invitational Champion has Scotty Ryan, along with the Coastal Championship, in his sights. All in all, it was an exciting and important afternoon at The Aberdeen Hotel. Next on tap is PROGRESS x EPW on April 18, with a huge main event is already in DAVIS STORM taking on PETE DUNNE. With names such as TRAVIS BANKS, JIMMY HAVOC, TONI STORM and MOUSTACHE MOUNTAIN (TYLER BATE and TRENT SEVEN) announced, who from our fair shores will step up and show the world what EPW is all about? 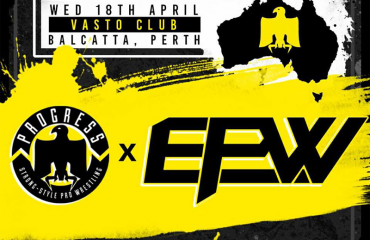 Make sure you keep up to date with epwperth.com for all the latest information!